As the sun reemerged over the Antarctic horizon in August after the long, dark austral winter, satellites could once again peer at a rift that has been wending its way across the white expanse of the Larsen C Ice Shelf on the eastern side of the Antarctic Peninsula. To the surprise of scientists, satellite images revealed that the fissure had grown by about 13 miles over just a few months — much faster than its previous pace. The rift in the Larsen C ice shelf that will eventually lead to a major iceberg calving event. Eventually the rift could progress to the opposite edge of the floating tongue of ice and cause a massive iceberg to break off. While this process is a natural part of the life cycle of an ice shelf, there is concern that when it occurs, it could usher in a period of irrevocable retreat and possibly lead to the ice shelf’s demise and further contributions to global sea level rise. When an iceberg might break off is anybody’s guess — it could happen in months, or it could take years — though any ice shelf collapse would likely take decades, experts say. But monitoring the progression of this rift will help glaciologists better gauge the conditions on other ice shelves around the continent, which collectively hold back millions of cubic miles of ice. 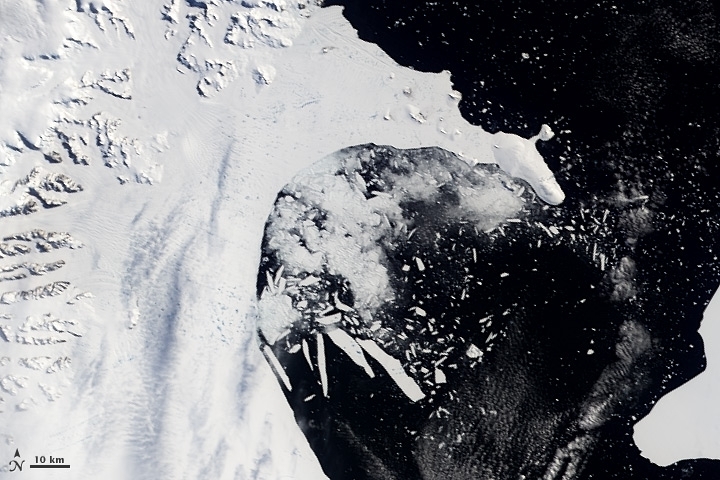 Scientists have been watching the Larsen C ice shelf with a wary eye ever since the spectacular disintegrations of its northern neighbors, Larsen A and B, in 1995 and 2002, respectively. “The wave of collapse has been progressing north to south in the Antarctic Peninsula,” Ala Khazendar of NASA’s Jet Propulsion Laboratory said. Ice shelves work like backstops, slowing the flow of the glaciers that feed them. When an ice shelf collapses, those glaciers speed up, meaning they send more ice from land to ocean, raising sea levels. In the case of Larsen B, the glaciers that fed it flowed six times faster after its demise. Larsen C is 10 times the size of Larsen B and the fourth-biggest ice shelf in Antarctica, so if and when it goes, the resulting sea level rise would be substantial. On average, global sea level has risen by about 8 inches since pre-industrial times; the entire West Antarctic Ice Sheet contains enough ice to raise sea levels another 10 to 13 feet. 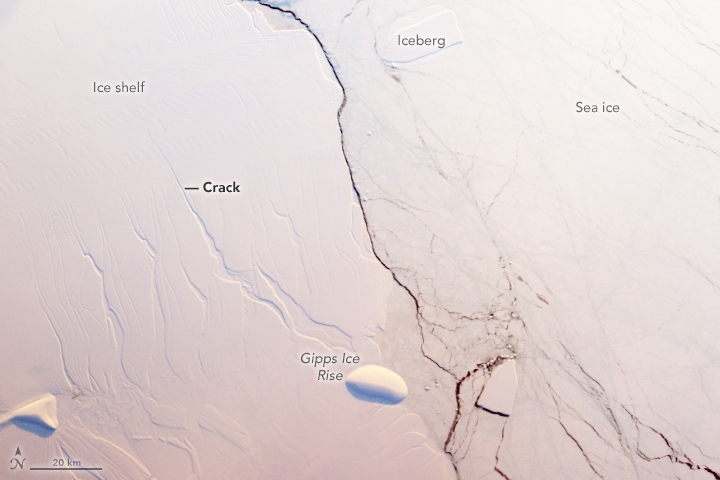 The rift working its way across the ice shelf is one of a larger grouping that has been present for more than 50 years, possibly formed by the stresses of the ice shelf pressing against a ridge on the seafloor below it. Iceberg calving is part of the natural push and pull of the ice shelf system — calving pushes back the front of the ice shelf, while the glaciers flowing into it push it forward again. The concern in this case lies in what that calving event then leads to, as the ice shelf will then be at its lowest extent since scientific observations began. “That opens important questions about how the ice shelf responds,” Dan McGrath, a glaciologist at Colorado State University, said. In the case of Larsen B, the forward movement of the glaciers couldn’t keep pace with calving. “Those big calving events were taking place, were occurring at such a rate that the ice shelf never had time to grow back again,” Khazendar said. The breakup of Antarctica's Larsen B ice shelf as it looked on Feb. 23, 2002. One big question is whether a calving event would lead to rifts closer to the ice shelf’s grounding line, or the point where land-bound glacier ice begins to float on ocean water. Rifts leading to iceberg calving there would lead to a much greater speed-up, McGrath said. For now, none of the scientists who are keeping a close eye on Larsen C expect it to go the way of Larsen A or B anytime soon. Larsen B’s destruction had the added pressure of substantial surface warming and melt, something that hasn’t become a widespread issue yet on Larsen C.
If that surface melt is an essential component of collapse, “it might be that the Larsen C is not quite ripe yet,” Jansen said. McGrath hopes to make a field expedition to the ice shelf in the coming years with the aim of putting sensors down near the rift to get a better picture of the complex interplay of stresses acting on and within the ice shelf and where the rift might go in the future. Getting a more detailed picture of this rift could help scientists better understand those on other, larger, ice shelves, that pose an even bigger sea level rise threat, McGrath said. Effectively, this rift and its possible effects are “a natural experiment taking place in front of our eyes,” Khazendar said.